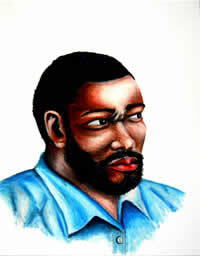 Bongumusa Hlongwa is a 21-year-old artist, born at KwaMaphumulo in KwaZulu Natal. He is currently resident in UMlazi, Durban. He is currently competing his 3rd year of study towards his National Diploma of Fine Art at Durban University of Technology (DUT). 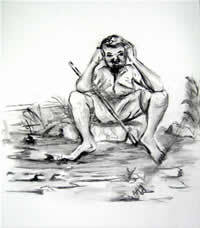 I'm an artist focusing in drawing, printmaking, sculpture and painting. I have a strong technical background in most mediums. I explore diverse issues in life and thinking of original ideas to make art and my mind creative. I am trained to think out of a box, so I always bring a different thought and originality on my works. My work is about my experiences from being a child to adulthood. I document my experiences and memories, by using language, found objects and visual references. 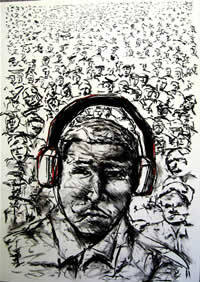 Through my artworks I depict my self-portrait and semiotics objects related to my personal experiences. I focus on the issues that I was censored to observe and to do. I look at how there isolate me to my friends and relatives. I also look these issues as how there becomes a reflection of a life that I live to my adulthood. My artworks are intended to make an awareness of these issues, as well as a process of healing. By documenting my life I am trying to purge pain, memories and isolation, through the creation and presentation of creativity. -National arts creative youth festival exhibition at DUT Art Galley. -Igalelo lika Trevor Makhoba Awards exhibition at the Bat Centre. 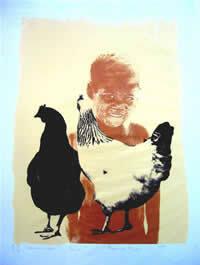 -Amasiko ethu group exhibition in Menzi Mchunu gallery at the Bat Centre. -Fine Art 2nd year students group end of year exhibition at DUT studios. - Amandla okuqala group exhibition at DUT Art Gallery. - Absa art awards exhibition at Absa Gallery in Johannesburg. - Grand-pa art Awards exhibition at Grand-pa gallery in Johannesburg.